two − = 1 Required Please enter the correct value. The Tesla stock price is down nearly 3% today (Monday), even as the company prepares to deliver its first Model X SUVs at a highly publicized event tomorrow evening. This is a major event for the company because right now, Tesla Motors Inc. (Nasdaq: TSLA) only sells one vehicle, the Model S sedan. The Model X will be priced similarly to the Model S, with a starting cost of $70,000. High-end versions of the vehicle will retail at a range between $132,000 and $144,000. The Tesla Model X will have a battery range of roughly 215 miles to 217 miles. That's also similar to the Model S. One big difference, however, is the Model X's "falcon wing" doors, which open vertically. We already know what the vehicle looks like, since it was first unveiled in 2012. 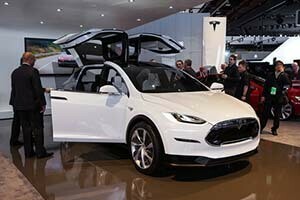 But this is the first time the Model X will be delivered to a customer. There will likely be a handful of customers who go to the Tesla event to receive their vehicles. CEO Elon Musk has said sales of the Model X will help the company reach its total vehicle delivery goal of 50,000 to 55,000 for the full-year 2015. Tesla stock has weathered the market's recent volatility surprisingly well. The Tesla stock price is still up 12.2% in 2015, compared to a loss of 10.2% for the Dow Jones and a loss of 4% for the Nasdaq during the same time. In the last six months, TSLA stock is up almost 35%. The Model X is just the next step for the company, which is also developing a more moderately priced Model 3 sedan. The Model 3 is expected to cost closer to $30,000. Follow us on Twitter @moneymorning. Like us on Facebook: Money Morning.